We manufacture and sell all types of ground rod clamps. Let me know if you are looking for something in particular. Chris at KF7P dot com. Flat joining clamps will join two (or more) lengths of copper strap when the end of your strap doesn’t happen to end at a ground rod. Hardware is stainless steel with nylock nuts. 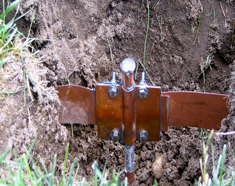 Attach two Alpha Delta surge units to your ground rod. A perfect way to ground your vertical antenna and provide surge protection on outgoing coax lines at the same time. Clamps can also be used as a quick and easy “single point ground” before cables enter the building. 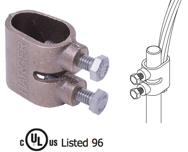 Clamps are made entirely from copper and include a copper ground lug to fit up to a #4 wire, and secure with stainless steel hardware and nylock nuts. Designed for 5/8” ground rod (see ordering instructions above). Click pic for larger version. I'm so glad I found Chris' website. The quality of his work beats anything I can find anywhere else. Thanks again Chris! These clamps are a simple and effective way of attaching ground rods to your flat copper strap. Copper strap passes right through the center of the clamps and does not require drilling holes through strap. They also provide a convenient place to join two lengths of strap. Hardware is stainless steel with nylock nuts. See Anti Oxidant Connection Grease below for assembly instructions. Attach two Morgan Manufacturing surge units to your ground rod. 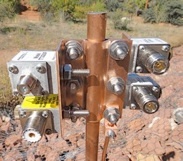 A perfect way to ground your vertical antenna and provide surge protection on outgoing coax lines at the same time. Clamps can also be used as a quick and easy “single point ground” before cables enter the building. Clamps are made entirely from copper and and secure with stainless steel hardware and nylock nuts. Includes hardware for Morgan unit(s) too! Designed for 5/8” ground rod (see ordering instructions above). Click pic for larger version. Only fits M-300, M-301, M-302, and M-303. Copper wire lug for ground wire, 4-14 gauge, and 2-14 gauge. Brass “acorn” nut, for connecting copper wire to your ground rod. Fits 1/2” and 5/8” ground rods. Copper split bolt for connecting two 4 gauge copper ground wires. Copper based anti oxidant connection grease for all copper to copper connections is ideal for copper strap connection points. When applied liberally to the surfaces connection point, the grease will fill voids, seal out air and moisture which causes oxidation, and provide better conductivity. Liquid electrical tape, great for sealing and weatherproofing connectors outdoors. Brush in can; 4 oz. This is the easiest and most convenient way to ground your coax shields at the base of a tower, entry point, or other antenna location. Solid copper clamp is made from .0937” (13 gauge) copper, weighs in at 3/4 of a pound, squeezes a 5/8” ground rod with six stainless steel bolts, and comes with four UHF bulkhead connectors and hardware. You supply the coax! Heavy duty ground rod clamp is cast bronze and fits 1/2”, 5/8”, and 3/4” ground rods. Provides over 1.5” of conductor contact area with ground rod, and fixing bolts are stainless steel. Fits conductor size #6 through 0000 gauge. Ubolt ground rod clamp is also cast bronze and fits 1/2”, 5/8”, and 3/4” ground rods. Provides over 1.5” of conductor contact area with ground rod, and hardware is stainless steel. 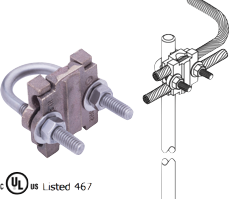 Ubolt ground rod clamp can fit two horizontal conductors or one vertical conductor, sizes #6 through 0000 gauge.